Use GeoPeeker to ensure that your site is displaying region-specific content. Create an advanced peek and customize resolutions, render delay, user-agent settings, and peek locations. With GeoPeeker you can make sure that your DNS updates are propagating properly and keep track of changes over time. There is no better tool for answering the age-old question: Is it down for just me, or everybody? In addition to providing site source code, GeoPeeker can also tell you the ping timings of your site from various points of presence around the globe. 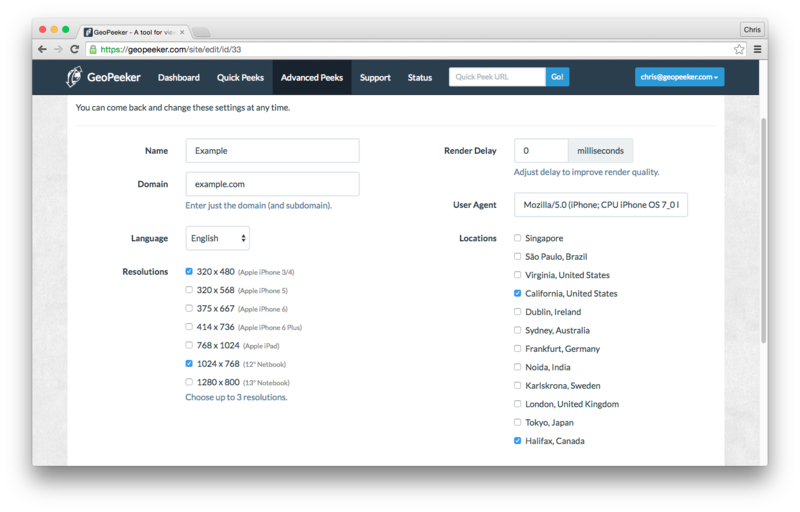 Use our friendly API to integrate GeoPeeker's features into your own applications. When you want to know what a site looks like outside your current geographic location, proxies can be useful but often don't provide the most accurate local version of a site. GeoPeeker is built on a network of servers spread around the globe that provide fast access to better, more accurate information than proxies by sampling directly at the source. Unlike other more complicated solutions, GeoPeeker can render a site in mulitple locations simultaneously and quickly, all without installing any software or messing with your browser or network settings. GeoPeeker was developed for and by developers who use the tool every day as part of their core set of tools. Have a suggestion for a new feature? Just let us know! 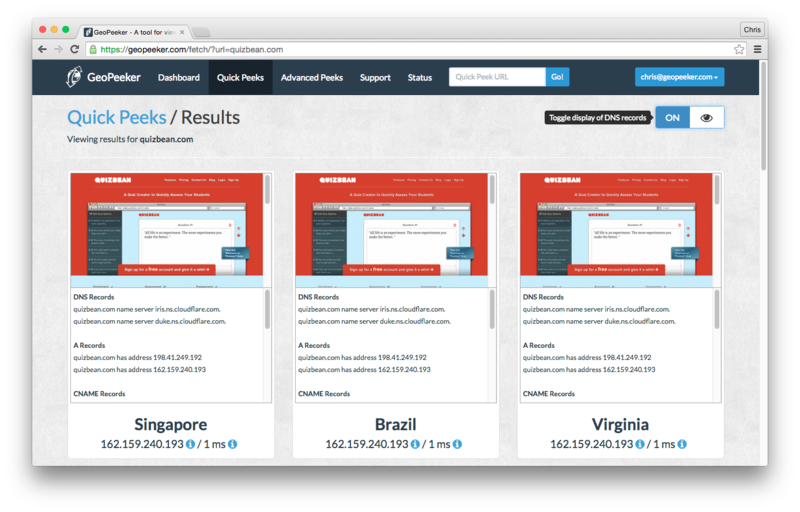 With a paid GeoPeeker subscription you have access to multiple screen resolutions and languages. Want to know what your site looks like in Canada running on a French iPhone 6+? With our advanced peeks, it's no problem!